Wouldn’t you love to turn a favorite house from your childhood into your family’s dream home? 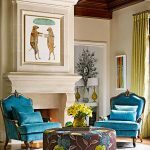 With the help of Nashville-based interior designer Sarah Bartholomew, that is exactly what the lucky homeowner of this 1926 Georgian Revival was able to do! 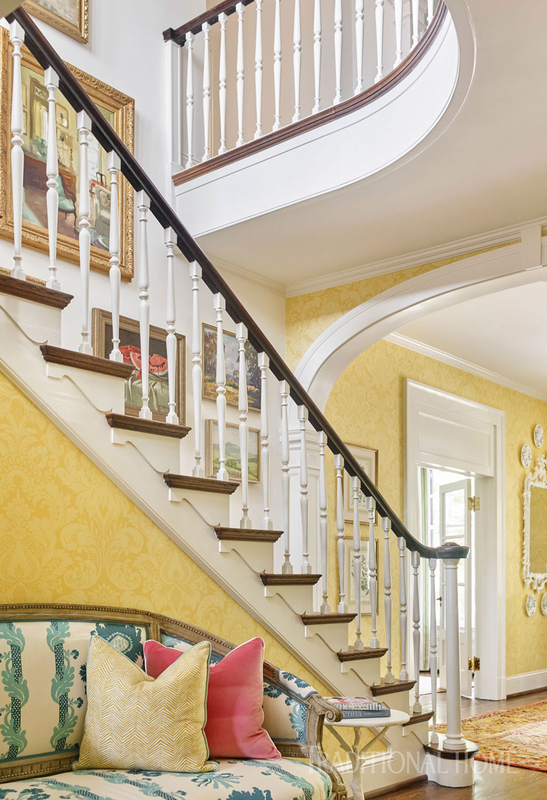 Photographed by Emily Followill and gracing the cover of the May/June issue of Traditional Home, the stately home is brimming with fresh, cheery hues and artfully mixed patterns. 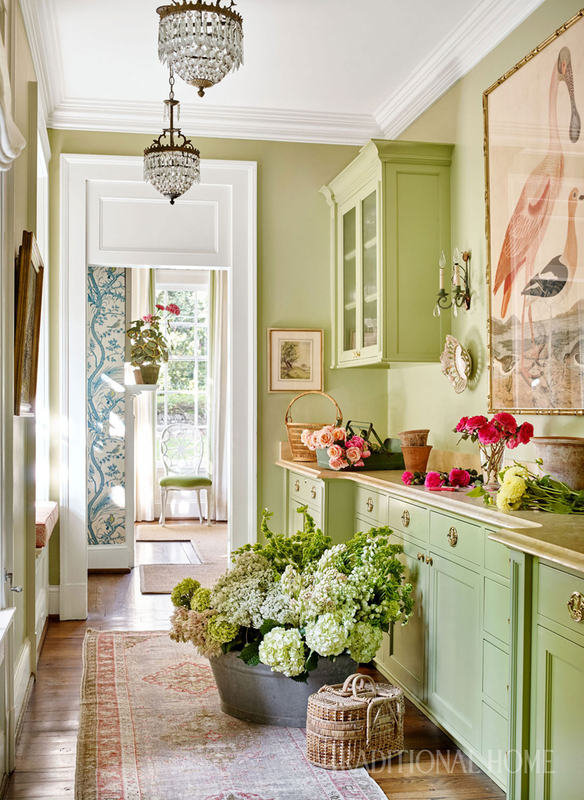 The entryway above is a stunning introduction to the springy palette woven throughout the home. 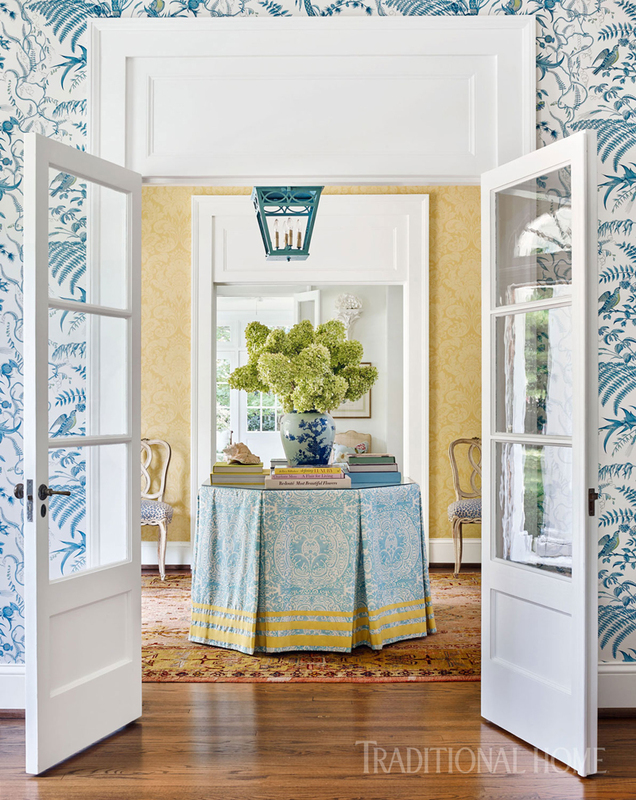 Loving the center hall table covered in Quadrille’s “Veneto” fabric! 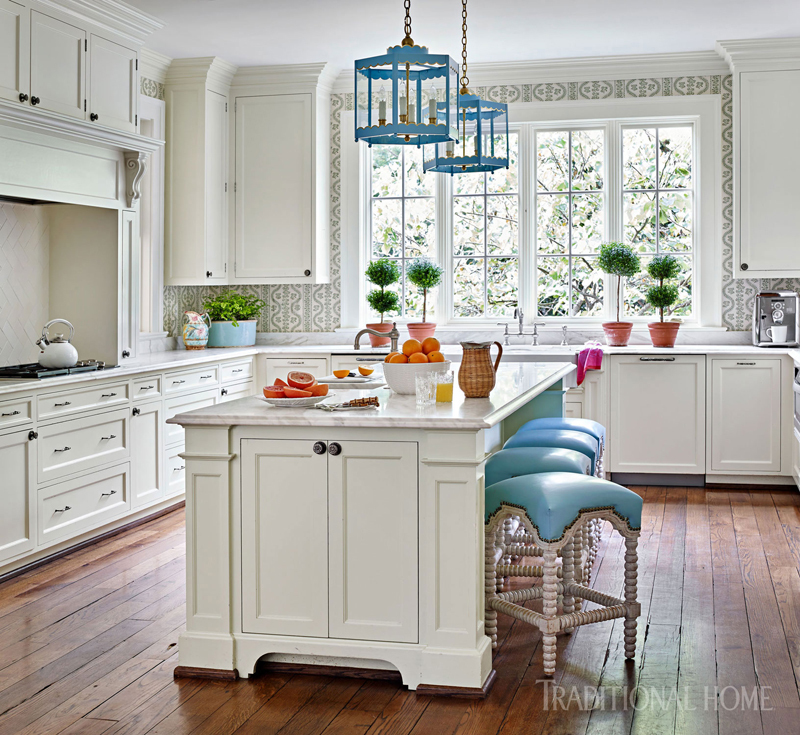 The blue stools and Coleen & Company scalloped lanterns add a dash of color to the white kitchen. So in love with the “Bird and Thistle” wallpaper by Brunschwig & Fils. Gorgeous detail on the chairs too! The homeowner has some amazing collections, including the Chinese porcelain vases and jars lining the mantel. So many beautiful details in the daughter’s bedroom. You know I’m digging the color palette too! There’s still a lot more to see…to finish the tour, read all about the home and learn sources, visit Traditional Home. And for more beautiful and inspiring designs by Sarah Bartholomew, visit her website and Instagram. 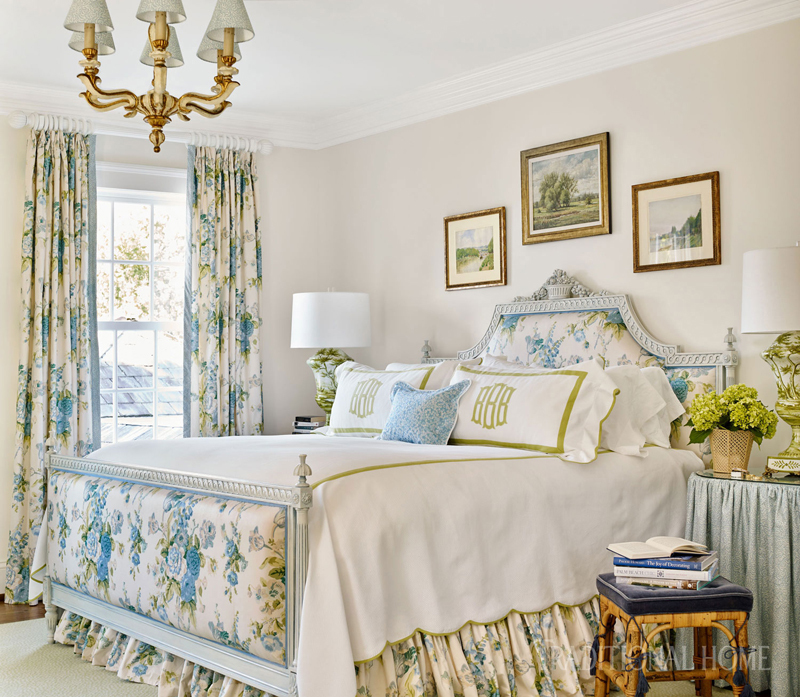 I seriously can’t get enough of her signature fresh spin on traditional style! 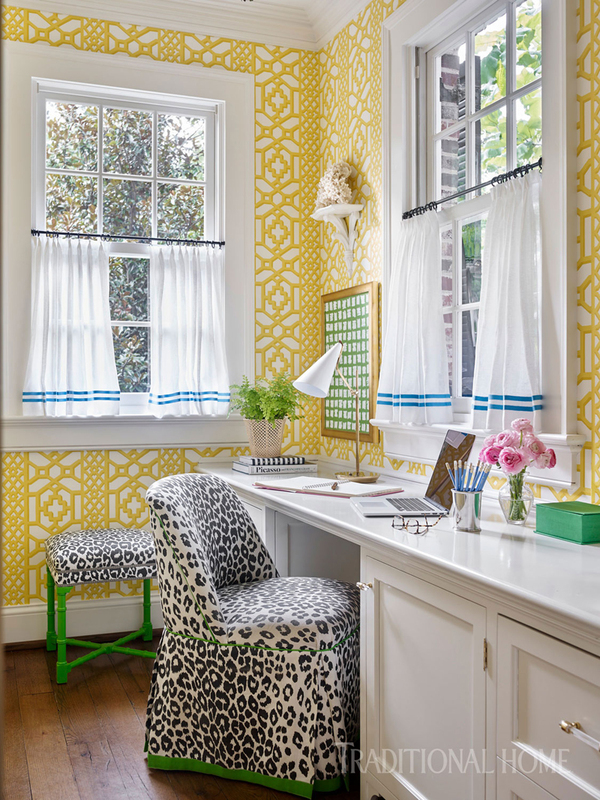 For another gorgeous home I’ve featured by the Nashville-based designer, go here! Great design. I especially loved the kitchen and living area, they look adorable. Those blue pendants in the kitchen. Love Colleen Rider’s work. 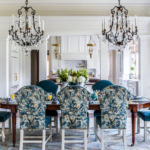 so much ‘pretty’ to see in this gorgeous home! 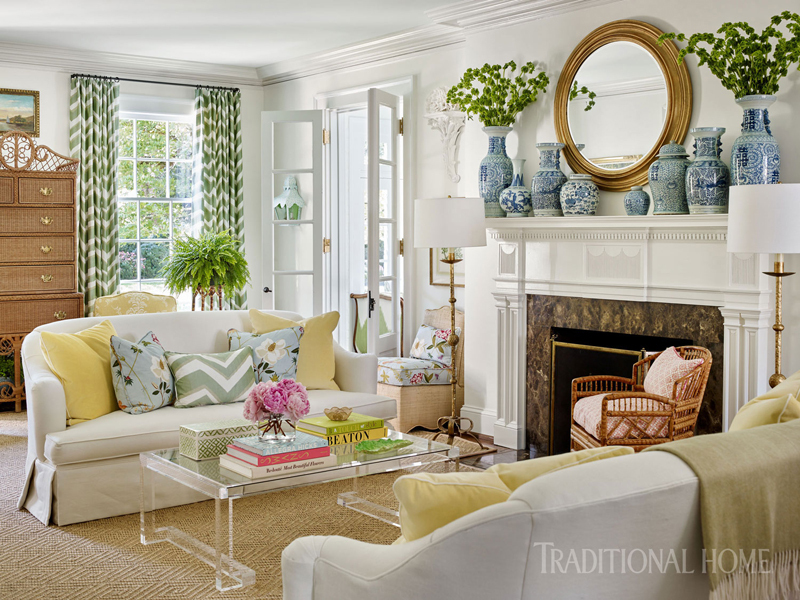 Love that green sofa! Gorgeous! 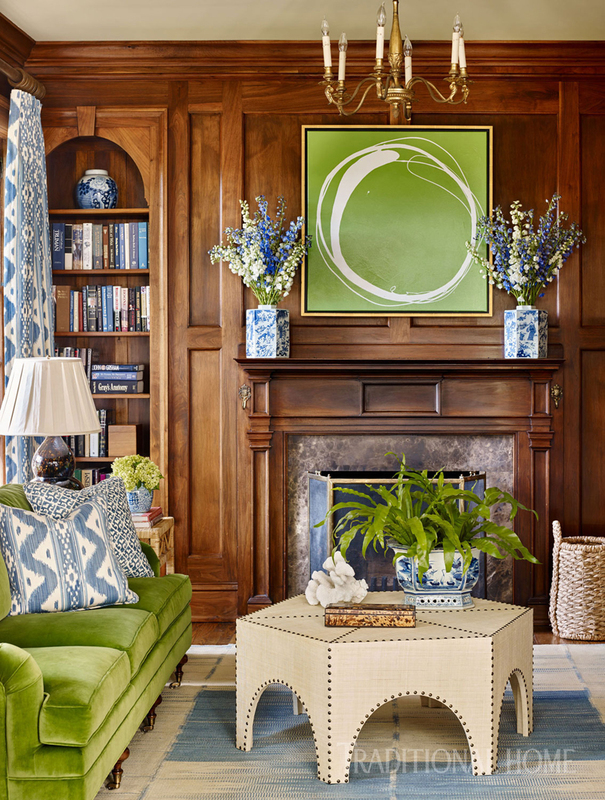 I love the Formal touches and the pops of color. So elegant yet approachable at the same time. love love love. Erin, I hope everything is OK with you and your family. I’m concerned because you haven’t posted to this site or your shopping site in weeks, and it appears you’re now getting spam comments on this site that haven’t been moderated/deleted. You haven’t updated your social media in weeks (some of it, like Twitter, for a lot longer than that! ), and I’m finding it worrisome. Hoping all is well with you and you haven’t abandoned House of Turquoise. Would love to hear from you again! Such a relief to hear from you! Glad that all is OK. Breaks are good to have, I just got worried LOL! Looking forward to seeing more from you on HoT! Absolutely stunning professional interior photography. Love the elegance of your blog!